Vitamin C is commonly known to be essential to human health. However, specifically as it relates to cancer treatment, the value of vitamin C is debated and often considered a topic of scientific controversy. Cancer researchers have investigated various ways of administering high-dose vitamin C, including both orally and intravenously. Researchers have also examined different forms of vitamin C—ascorbic acid (AA) and dehydroascorbic acid (DHA)—which may well be a comparison of apples and oranges. In 1952, William J. McCormick, M.D. speculated that vitamin C could be useful as an anti-cancer agent by strengthening collagen and thereby preventing the spread of metastases. The idea was revisited in the early 1970s by Ewan Cameron, M.D. and his Scottish colleagues. They administered high dose AA to patients with advanced cancer. Linus Pauling, Ph.D., winner of two Nobel prizes, and Cameron coauthored two retrospective case series that suggested high doses of vitamin C as a treatment agent substantially prolonged life and improved well being in some patients with advanced cancer. However, two double-blind, placebo-controlled clinical trials performed in the late 1970s and early 1980s at the Mayo clinic showed no anti-cancer effects from high-dose vitamin C, and interest in the field waned. More recent research shed light on why the Mayo clinic trials were not comparable to the earlier case series of Cameron and Pauling. Cameron administered AA both orally and intravenously, but the Mayo clinic investigators used only oral AA. Research over the past decade has shown that vitamin C concentrations in humans are carefully regulated, in part by diminished absorption in the intestine as doses increase. Intravenous administration produces concentrations that can be more than 100 fold higher than concentrations produced by maximal oral doses. Thus, most of the 10 gram oral dose administered in the Mayo clinic trials—approximately 100 times the Recommended Dietary Allowance—would have been directly excreted, unable to reach the targeted cancer cells. 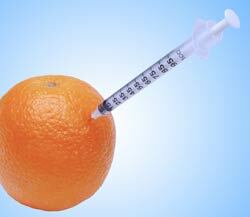 Recently, researchers at NIH have revisited the potential of vitamin C as an anti-cancer agent. To circumvent the absorption problem seen with oral dosing, researchers from the NIH’s National Institute of Diabetes and Digestive and Kidney Diseases (NIDDK), led by Mark Levine, M.D., tested intravenous or intraperitoneal injections of high-dose AA in mouse models of ovarian cancer, pancreatic cancer, and glioblastoma. In all three tumor types, the injections reduced tumor growth by approximately half compared with untreated mice. In addition, metastases were found in about 30 percent of untreated mice, but in none of the mice injected with AA. The study was published in the August 12, 2008 Proceedings of the National Academy of Science. In additional work, investigators at the University of Kansas Medical Center led by Jeanne Drisko, M.D., were able to achieve similar concentrations of AA as those achieved in the mice by using intravenous injections in human subjects with ovarian cancer. This work has since been confirmed in a phase I clinical trial led by L. John Hoffer, M.D., Ph.D.
“The way that the body handles oral and intravenous vitamin C differently raises the question of whether or not the clinical trials that were done with only the oral formulation were adequate to help us understand the role, if any, vitamin C has in cancer treatment,” said Dr. Jeffrey D. White, director of OCCAM. More questions were recently raised by a study from the Memorial Sloan-Kettering Cancer Center about using vitamin C in combination with traditional chemotherapeutic drugs. In that study led by Mark Heaney M.D., Ph.D., published in the October 1, 2008 issue of Cancer Research, investigators injected tumor-bearing mice with a combination of DHA, the oxidized form of vitamin C, and the chemotherapy drug doxorubicin. They found that mice receiving the combination had tumors four times larger than the tumors in mice treated with doxorubicin alone. Corresponding studies in cell lines suggested that the DHA may have protected the cancer cells’ mitochondria from doxorubicin-induced damage. In assessing the value of vitamin C as a cancer treatment, comparisons of the NIDDK and Memorial Sloan-Kettering studies have been made. However, there are some problems with making these comparisons. Two different forms of vitamin C, AA and DHA, were used in the studies. The studies had different aims. One looked at AA’s anti-cancer effects as a stand-alone therapy, while the other looked at the effects of DHA when used with certain chemotherapy agents. In addition, different dose ranges were examined, which would be similar to comparing pharmaceutical concentrations of vitamin C levels to that of an oral supplement. Dr. Levine’s laboratory is planning further preclinical studies to measure the effects of AA injections in combination with chemotherapy agents and to understand the mechanisms behind why high-dose AA affects some cancer cells but not normal cells. He hopes to use that information “to figure out which types of cancer may be sensitive to ascorbate [AA] and which wouldn’t be,” he explained. In addition, in the near future, “We think this work needs to go forward to targeted clinical trials, and we’re looking for clinical partners to help us do that,” said Dr. Levine.